“My wife and I didn’t get a chance to go on a Honeymoon right away after our wedding. When six months later, the opportunity to go to Jackson came around, we didn’t hesitate! We didn’t know anything about the area, but this Vacation Guide made it so easy for us. I highly recommend you download it! We found some of the best restaurants and museums in it. We already can’t wait to come back!” Patrick S.
With our complimentary Vacation Guide, you can spend less time researching for things to do and more time immersing yourself in our local culture. Whether you wish to enjoy Southern history and cuisine or treat your special someone to a romantic getaway, you’ll find the ideal way to make the most of your trip to Jackson, MS. If you want to create the most wonderful trip, request a copy of our Vacation Guide. 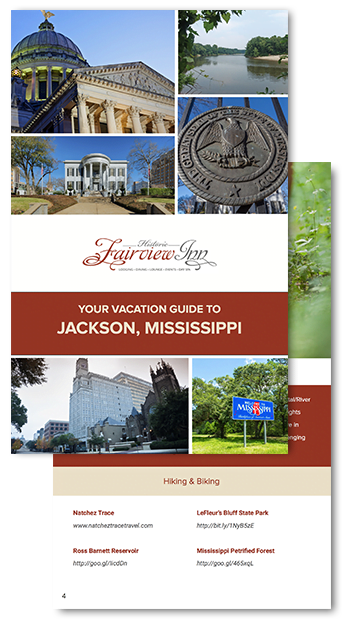 This free travel planner provides you with our top recommendations for the best Jackson attractions — right in the palm of your hand. Simply fill out the form below to unlock our favorite places and discover the charm of our historic yet modern destination! Calling all history scholars! 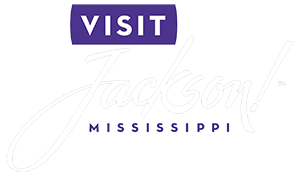 If you want to learn more about the intricate history of Jackson, take a tour at one of the historic sites or informative museums. Through the years, cultural changes and development have reshaped our Southern city into the place it is today. For a more in-depth look into our historically significant vacation destination, visit one of these places. Our easy-to-navigate Vacation Guide is a wonderful resource for planning the perfect date night with your significant other. As you browse, you’ll discover our top suggestions for dining establishments, each of which showcases excellently seasoned cuisine. If you’re having trouble deciding where to go, reserve your table at 1908 Provisions, our on-site restaurant. This marvelous eatery offers a gourmet selection of sumptuous small plates, enticing entrees, and decadent desserts. Another culinary destination is the Library Lounge, our on-site nightlife hub. This swanky lounge exudes an upscale yet casual environment and offers artfully crafted cocktails, exquisite wines, and savory craft brews. As your eyes wander around the room, you’ll be delighted by the collection of works by 20th-century authors from Mississippi. These charming places are the perfect ways to enjoy the culinary expertise of the Deep South! During your trip, there’s a myriad of ways to unwind. One of our favorite activities is booking an appointment at Nomispa. Our on-site spa offers an assortment of rejuvenating services, including invigorating facials, soothing massages, wonderful manicures & pedicures, and other luxurious body treatments. From the moment you and your partner escape into this hidden oasis on the first floor of our boutique hotel, you’ll feel the stress of your daily routine melt away. After your experience, spend your evenings together in your charming accommodation. Whatever way you decide to relax, Fairview Inn is the perfect retreat for your next getaway. Complete the form below to receive your free Vacation Guide to Jackson, MS, today!